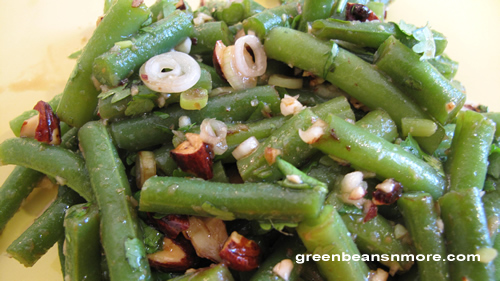 This cold green bean salad recipe first appeared in Bon Appetit Magazine in June 1996. The green beans are marinated in wonderful Asian flavors and served with crunchy soy flavored almonds and fresh cilantro. I've found the flavors to be much better when the green beans are allowed to marinate a day before serving. I'd suggest making the vinaigrette and marinating the green beans a day before serving. Add the green onions, almonds and fresh chopped cilantro just before serving. Place almonds in small nonstick skillet. Stir over medium heat until almonds are lightly toasted, about 5 minutes. Increase heat medium-high. Add 3 teaspoons soy sauce and stir until soy sauce evaporates and coats almonds, about 1 minute. Transfer to plate and cool. Chop almonds. Cook beans in large pot of boiling salted water until just tender, about 5 minutes. Drain. Rinse beans under cold water. Drain well. Almonds and beans can be prepared 6 hours ahead. Cover almonds and store at room temperature. Cover and refrigerate beans; bring to room temperature before continuing. Whisk vinegar, oil, garlic, ginger and remaining 1 teaspoon soy sauce in large bowl to blend. Add beans and toss to coat. Sprinkle green onions, cilantro and almonds over salad and serve. Cook's Notes: The first time I made this recipe I chopped both the garlic and ginger. It is much better if you grate them both (or grate the ginger and press the garlic). Watch the heat in the pan when you're glazing the almonds. Make sure you use a non stick skillet or keep the heat lower than medium-high. I used a small enameled cast iron skillet and medium-high heat in my pan burned the soy and I had to start over. I did not have low-sodium soy, regular worked fine.